Chef Florent Boivin and his team invite you to live a real experience , around an innovative and daring cuisine. From the legendary Sens Brothers 3 * Gardens of the Pourcel brothers to the management of the Maison Troisgros 3 * kitchens through international assignments, Chef Florent Boivin has created an exemplary career. Young Meilleur Ouvrier de France in 2011, he now transmits his know-how to the Paul Bocuse Institute. He is accompanied by Chef Olivier Pons, regularly rewarded by major gastronomic guides, who has directed the kitchens of prestigious establishments such as Château d'Igé (Saône-et-Loire) and Château de Puy Robert - Relais & Châteaux 1 * in Montignac. Enjoy a cuisine combining tradition and modernity, staged by a contemporary approach in cooking techniques and the uncluttered dressing of dishes. Choose an original cuisine, healthy and balanced although greedy, which values ​​the variety and freshness of the products. 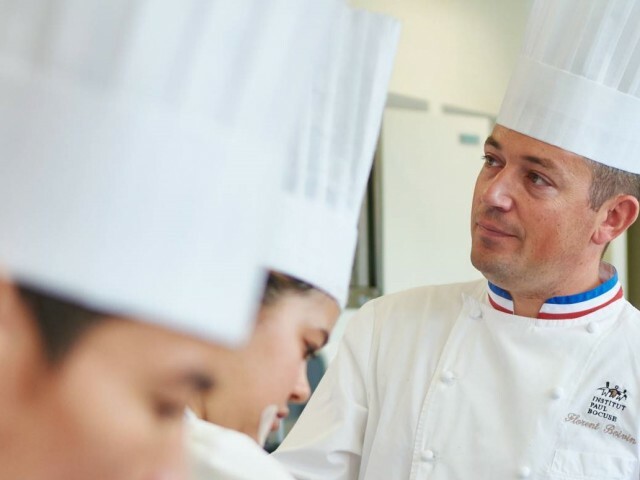 The students of the Paul Bocuse Institute take the orders of the restaurant to propose their menu around the influences of the world, made from products selected by the Chef. Innovation and design are the key words.